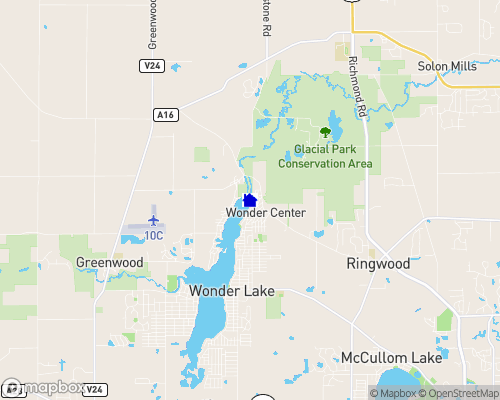 Wonder Lake in McHenry County, Illinois is bordered by a village of the same name. When you visit this lake and village, it’s like stepping back in time to an era with a slower pace and a friendlier face. When you rent a Wonder Lake lake house, you are booking an experience that is much more than a lake vacation. When you rent a Wonder Lake lake hous ...Learn more here! When you rent a Wonder Lake lake house, you are booking a front row seat to spectacular views of a serene stretch of nature. The Wonder Lake reservoir is 832 acres in size, with seven miles of shoreline. Six islands dot the lake, and 14 boat ramps serve the communities around the reservoir. Each housing subdivision has a dedicated beach, which means that even if the lake house you choose to rent doesn’t have its own stretch of shore, you can still find a lakeside spot to call your own. This is a great lake for swimming, as the average depth is only 6.5 feet. Fishing is hallmark of simpler times, and a favorite pastime of residents and visitors of Wonder Lake. There’s nothing that slows the frenzy of daily life like taking a break to recline in a boat or sit by the shore and wait for a fish to bite. At Wonder Lake, anglers can find bluegill, bream, bullheads, catfish, carp, crappie, largemouth bass, muskie, perch, and smallmouth bass. With such a broad array of fish, Wonder Lake is a great fishing destination. Each year, the Wonder Lake Sportsmans Club stocks the lake with over 3,000 game fish, making sure that you can always get a fish on your line. The Club also hosts a number of fishing derbies throughout the year ranging from the Spring Bass Derby in May to the Catfish Derby in August. A night on the town in Wonder Lake looks very different from the bar and club scenes of busy cities. Step out of the kitchen in your Wonder Lake lake house and instead enjoy a meal at The Grand Old Mill, a riverside restaurant with a classic old-timey atmosphere and wooden interior. They serve seafood, steaks, prime rib, lamb, and chicken. Besides fish and steaks, the relish tray is a popular item on the menu. Make sure to ask for Barb to wait on you when you go! A night at the Mill is a hometown experience you won’t want to miss. You can round out your evening in a bygone era by observing a Cruise Night in nearby McHenry. In the summer, Green Street is the home of weekly Cruise Nights, where locals showcase classic cars. Take a stroll and watch marvels of automobile engineering sparkle in the evening light. You won’t find the same cars every time you visit because different Cruise Nights feature unique styles of cars. One night might feature Fords, while another might feature exotic European makes. If you love the Green Street Cruise Nights, you can see even more classic cars by visiting the Cruise Nights of surrounding towns (Cary, Huntley, Marengo, and Richmond). Come to the shores of Wonder Lake and take a trip back to the good old days. You’ll love the slower pace of lake living in this Wonderful location.